Author's note: Working in groups can sometimes create problems for autodidactic learners in distance education; we have to set aside our autonomous habits to support the group process. That being said, I think working in groups (especially at distance) showcases how collaboration can yield positive results. Robin Beavers – Narrative which includes the scenario and rationale, course description and objectives as well as the Bates’ ACTION model framework. Eric Belt – Created PowerPoint presentation, transferred ingredients list to spreadsheet, drafted initial proposal and narrative foundation. Debbie Brown- Contributed to narrative draft, formulated list of ingredients, provided feedback on other documents. Antoinette Byrd- Recorded voice-over for PowerPoint presentation and reviewed documents provided feedback as needed. Jenna Campos – Spreadsheet completion including costing calculations and creation of graphs, proofread and edited narrative, contributed to completion of PowerPoint presentation. Jared University is a mid-sized dual mode institution that plans to offer an undergraduate course in Advertising, specifically titled Principles of Integrated Marketing Communications 101, in a blended learning environment. Integrated Marketing Communications (IMC) is marketing that promotes and brands an institution, business, or organization using a “consistent message, tone, look and feel across the offline and online worlds” (Olenski, 2012). According to the U.S. Bureau of Labor Statistics (Occupational Employment Statistics, 2012), employment of advertising and promotions managers is expected to grow 13 percent while employment of marketing managers is expected to grow 14 percent from 2010 to 2020. Jared University believes that one of education’s goals is to equip students with the skills that promote the “economic health of our society and the political health of a democracy” (Rheingold, 2010). To that end, we are dedicated to providing our students with an education that will make them relevant and marketable in today’s competitive and global workforce. Thus, Principles of Integrated Marketing Communications 101 is a viable addition for inclusion to the institution’s growing online undergraduate curriculum. Students who take this course are expected to have access to and working knowledge of basic word processing, Excel, email, and Internet searching capabilities. This course will examine the management and creative processes of techniques and issues in advertising as part of integrated marketing communications; public relations and promotional management, advertising principles, and consumer behavior. Additionally, the course will include the ethical, social, and economic aspects of advertising and the creative processes and integration of copywriting, art, print design, and all advertising platforms. The course is a three-credit course and requires approximately sixty hours of study time (4 hours a week throughout the 15 weeks of the semester). The course will be offered in both the fall and spring semesters. Describe the foundation and history of IMC. Describe and justify IMC best practices. Identify and estimate the value of customers and prospects. Describe the shared marketer/consumer relationship. Prepare message delivery and content. Estimate the return on customer investment. Describe and discuss challenges faced by IMC integration in organizations. The course development process extends over one year; during this time it absorbs half of the per annum staff-time of a course manager and a full time commitment of one secretarial staff. Over the next six years, in which the course will be presented, it will continue to absorb management time, albeit at the reduced rate of a third; it will continue to require the full time commitment of one secretarial staff. The course material is developed by the instructors in conjunction with the required textbook, within the policy restrictions and requirements of the institution. The required textbook is “Principles of Advertising & IMC w/ADSIM CD-ROM” by Tom Duncan (ISBN: 0071115390/9780071115391). Note: the included CD-ROM is incorporated into the instruction and the student is responsible for the cost of the textbook. Ten online quizzes are developed by the instructor and available online to the students via the Learning Management System (LMS) of the institution. Layout and design of the quizzes and clearance of copyright will be done in house. Other materials used during the course will be based on Internet resources, including journals, e-books and databases available through Jared University’s College Library. The use of social media websites like Facebook, Twitter, wiki’s and blogs may be incorporated as well. In this scenario, the instructor incurs the role of the tutor. Half of the required in-class sessions will be devoted to tutorial time for which seven hours are calculated. Students can ask questions and request help with exercises, quizzes, and assignments. The instructor will distribute three in-class tests during the course. In addition, the instructor will comment on one advertising project during the semester. The project will be made available online and explained thoroughly, during classroom instruction. Students will be assessed with ten online quizzes, three in-class tests, and one project incorporating both online and in-class instruction. The course is expected to attract 240 students per year. Money is earmarked to update the course in year three and to present the updated version from year four onward. In order to determine appropriate media for our course, we have used the Bates’ (1995) ACTIONS model to justify the university’s media choices. ACTIONS is an acronym for, Accessibility, Cost, Teaching and learning, Interactivity and user-friendliness, Organizational issues, Novelty, and Speed. Bates (2005) asserts that the accessibility and flexibility of technology for the target audience is one of the most important components to consider when considering which technologies to incorporate in a class. Our proposed course, Principles of Integrated Marketing Communications 101 is a course that will attract a diverse audience looking to careers in advertising, public relations, business promotions or a comparable field. The proposed class is blended; therefore, it is a combination of asynchronous and synchronous learning. This hybrid offers flexible learning (Bates, 2005) and class will impart the technical and face-to-face education that students in these socially and technically driven careers require. Technical requirements: In the class description and in the syllabus students are made aware that this is a hybrid course and therefore there are certain technical prerequisites. The online component of the class will be distributed via Jared University’s existing Learning Management System. Social media tools available free on the web may be used to supplement class resources. Therefore, Jared University advises its students to have access to a personal computer in order to complete their course work. Students who take this course are expected to have access to and working knowledge of basic word processing Excel, email, and Internet searching capabilities. However, Jared is respectfully aware that not all students can afford their own computers; therefore, there is a 24-hour on campus computer lab open to its students. Jared University’s campus is also fully wired, offering Wi-Fi- to anyone with an Internet ready device on its campus. A great deal of the cost for this course has already been incurred by the existing LMS license. In addition, the inclusion of various Web 2.0 social media tools will cost nothing at all. Recurring costs include salaries for the content manger and secretarial support. Other costs associated with the development of this course include development and production of print material and associated costs, tutoring and student support as well as maintenance. 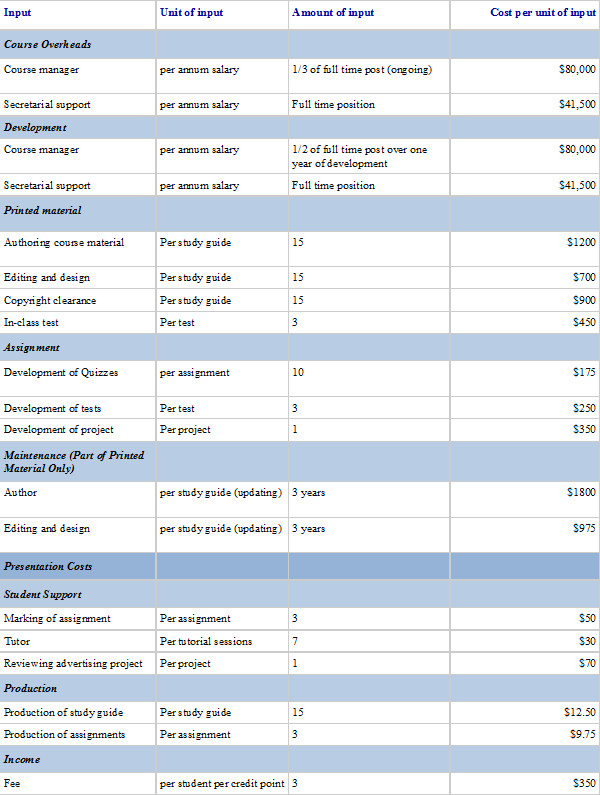 Please see the attached Excel sheet for specific itemized cost details. A viable career in a field using Integrated Marketing Communication (IMC) depends heavily on both social and technical skills; therefore, the University decided that this course will be an ideal candidate for blended delivery. As a hybrid course, IMC incorporates Computer Based Learning (CBL) and a Computer Mediated Communication (CMC) integrating both synchronous (TypeB1) and asynchronous (TypeB2) typologies (Huelsmann, 2013; Rumble, 2001). Both the print textbook and its accompanying CD-ROM, as well as the existing LMS (Huelsmann, 2013) provide these. This delivery method relies greatly on the instructor assuming the role of traditional teacher/tutor and the online role of facilitator. Additionally, the instructor by virtue of his presence will serve as a technical assistant. Our course uses three types of learning: face-to-face with the instructor, the online Learning Management System (LMS) and the external supplemental web based resources. Learners will be working with a variety of media including print, in class hands-on activities, which will allow for the course to accommodate a variety of learning styles (Bates, 2005). The LMS and online tools can be used for “collaborative learning, group projects, problem-solving, and creative thinking, all skills needed in a knowledge-based society” (Bates, 2009). This hybrid delivery offers both one-way and two-way interaction. The one way interaction is provided by the textbook, handouts, etc. and CD-ROM while the face-to-face sessions will afford the learner a sense of community assuring interactivity with the instructor and fellow students. This will also afford immediate feedback and assessment from both instructor and fellow classmates. Additionally, online communication will be a part of the course due to the LMS discussion forum and other social media tools incorporated by the instructor. Ease of Use: As Bates (2005) points out, printed text in the form of a book is as simple as it gets. There is no other equipment required to read a book or guide. The accompanying CD-ROM is also simple technology. As far as using the University’s LMS platform, there are online tutorials as well as 24/7 technical help by phone or live chat. As a dual mode institution, Jared University already has technical and academic support in place for both faculty and students. However, the University is also aware of the need to assess its course offerings frequently to determine if institutional goals and objectives are being met. Therefore, Jared also has various committees with academic, support services, and technical expertise evaluating feedback and outcomes in order to implement timely updates, assessments and necessary adjustments. Jared University is also fully aware of the need to supplement its academic course offerings with dynamic and real world experience. Thus, Jared University is an active member of the community and actively seeks to form collaborative partnerships with businesses and other academic and cultural institutions within the area. There is nothing new being used, print, LMS, and social media tools. Bates (2005) notes that print is the slowest of the media, in regards to the time it takes to develop and that it may quickly become out of date. This course uses one textbook that was published in 2004. Printed guides also take time however; supplementation of web resources can bolster and provide new and current information to enhance the principles and foundation of the textbook and guides used in the class. Bates, A.W. (2005). Technology, e learning, and distance education. New York: Routledge. Bates, A.W. (1995). Technology, open learning and distance education. New York, NY: Routledge. Rumble, G. (1997). The costs and economics of open and distance learning. London: Kogan Page.